Tesla Inc. (TSLA) recently posted a comparison chart between Model S and Model 3 that highlights main differences between the two vehicles. However Tesla did not mention which specific Model S version they are comparing Model 3 to. Let’s first compare the base Tesla Model S which is equipped with a 75 kWh battery pack therefore might be the most affected with the Model 3 launch, which is expected to start with a 60 kWh battery pack for the base model. * Tesla Model 3 is speculated to start at 60 kWh battery and a top spec model would be equipped with a 75 kWh pack. The price difference of base Model S and 3 is $34,500 which basically means that you can buy two Model 3s in the price of one Tesla Model S 75. This might be the reason Tesla did not mention the price comparison on their official comparison page. Performance is another area that Tesla is focusing while trying to anti-sell Model 3, let’s go through the stats to see the actual numbers and do they even matter for a car that is intended to be a daily runner. A measly 0.1 second defines the difference of 0-60 mph of the base models of both cars and that is surely ignore-able. The only difference that really means something is with the P100D but we can buy four Model 3s in the price of one P100D and in a day-to-day life we are not street racing. So we think performance difference will not be a big issue for most of the masses that this car is made for. Tesla’s comparison chart does not mention the top-speed of Model 3 and that’s not without a reason, the top-speed of Model 3 would be very close to the Model S’s 155 mph, we will know for sure soon in July. Let’s look at the ‘Range’ comparison of both the electric cars. The historical data for the Model S suggest that a 60 kWh battery gave less range than a Model 3 will have, that’s certainly because of the size and weight difference of both vehicles. Also Model 3 has one less screen which is the driver display and the center screen is also 2″ smaller in size and looks oddly placed as it’s not integrated into the dashboard. Tesla also highlighted passenger capacity in comparison to Model 3 which is 7 vs 5. 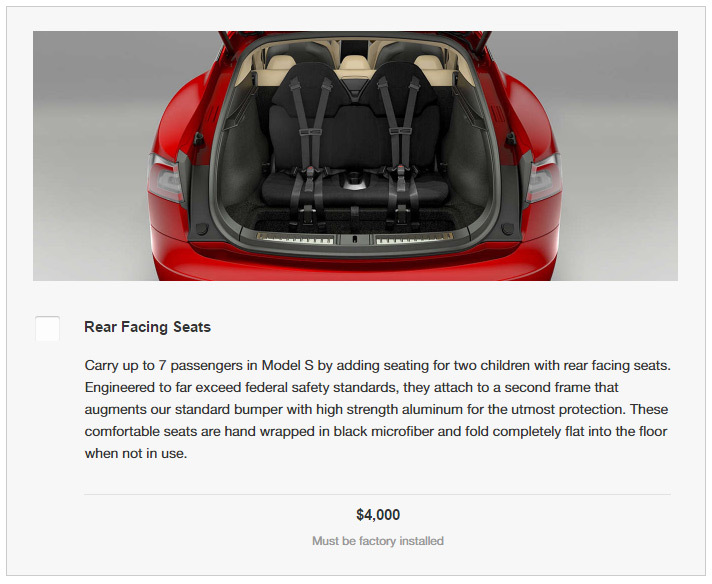 The +2 room in Model S is enabled by converting the trunk into seating space only after additional $4,000 upgrade of rear facing seats for kids. Surely this is an expensive option that gives Model 3 another edge in the cost department over the S.
Let’s go through the following table to get an idea of the cost of the ‘Features’ mentioned by Tesla on their chart (at the end of the page) and not having some of them on the Model 3 is either inevitable or plain cost effective even for the Model S owners. As we can see the features mentioned by Tesla as exclusive to Model S are actually able to hit a dent on the customer’s wallet or even the bank account like the Smart Air Suspension ($20,500) and $4,500 for 21″ wheels. Tesla is rigorously trying to anti-sell the Model 3 because of low profit margins and time constraints, although they have prepared for accelerated production at the Fremont factory and the Kuka robots are in place on the production lines, still delivering 400,000+ cars is a herculean task. Below is the comparison chart (updated with premium features) from Tesla Inc. an attempt at anti-selling Model 3. You can also compare Model 3 exterior dimensions with competing sedans like Audi A4, BMW 3 Series and several others here. 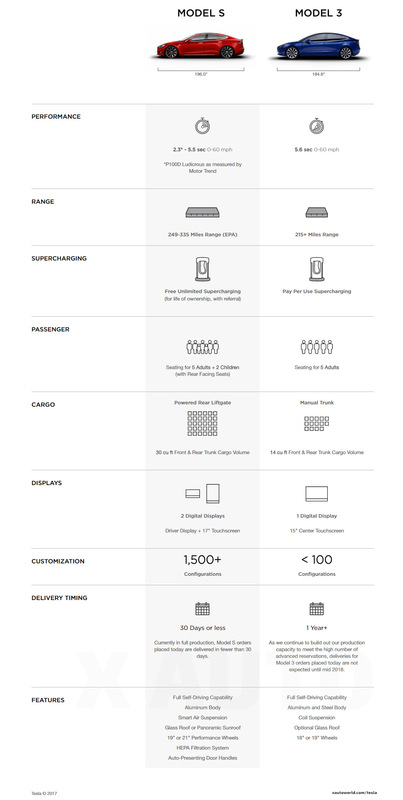 Official Tesla Model 3 feature comparison chart with Model S. Updated after premium options revealed by Tesla Inc.
Now it’s up to you to decide in light of the above data if you want a Model 3 or not, let us know your thoughts in the comment section below or on our Facebook page. An in-depth comparison of the Model 3 with S ! actually you can buy 2 Model 3s in the price on base Model s 75 !